Two worlds – football and theatre – with seemingly not much in common. One is opium for the masses and a multibillion-dollar industry, whose legions of supporters and their network of organisations often act as a litmus test for society’s repressed mores: from nationalism and xenophobia to political violence and civil wars. Theatre, on the other hand, is one of fine arts whose liberal and enlightened ethos allegedly stands as counterbalance to such dangerous tendencies. What could ensue from a meeting of these two worlds? Have they anything to say to each other? In times when unprecedented economic inequality, anti-immigrant populism and disillusionment with political system steadily erode the fabric of society, can we recognise ourselves in others? Is there anything left to share between ever more dispersed and isolated enclaves of our fragmented communities? Do You Still Love Me? examines the dramatic moments in which collective behaviour intertwines with the private sphere; it takes theatre and football as a twin lens through which to consider the notions of community and belonging, and the importance of love in its many complex and contradictory incarnations. Four die-hard supporters of the local club Stade de Reims and four die-hard professional performers are brought together on stage to reflect on what it is they really believe in, and at what cost. Weaving their personal memories, anecdotes and opinions with fragments of theatre classics on love and passion, they create a series of situations in which both sides’ views are put under scrutiny and held up as mirrors to the passions and prejudices that underlie them. As they soldieron attempting to put themselves into each other’s shoes, the participants touch upon a range of subjects, from nationalism, family and religion, to propaganda, violence and racism, to broken hearts and the inevitability of hope. 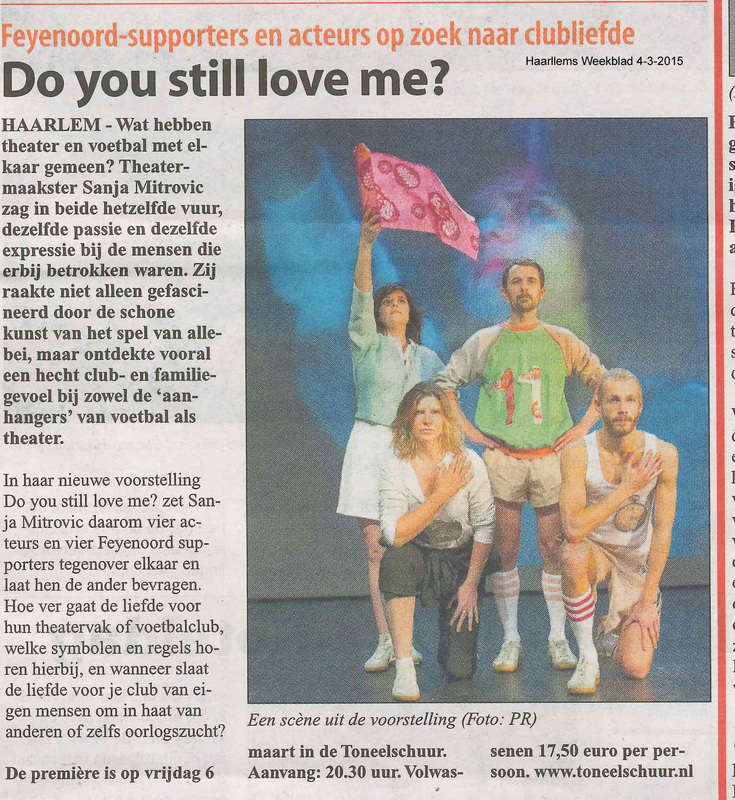 After the premiere in France, Do You Still Love Me? toured the Netherlands and Belgium. 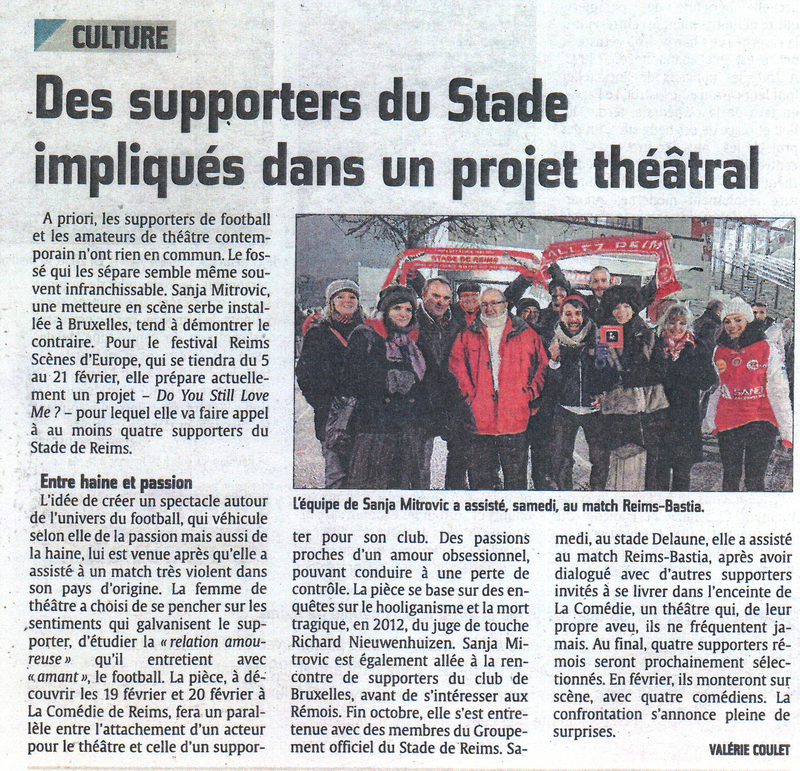 The production had, so far, three different versions, each with supporters of local football clubs. In addition to Stade de Reims, these include Feyenoord Rotterdam in the Netherlands, and Royale Union Saint-Gilloise from Brussels. In 2016 a new version will be made together with the Olympique de Marseille supporters and it will open La Biennale des Ecritures du Réel on the 2nd of March 2016.